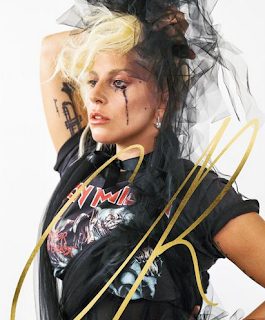 MetalRockNews: Lady Gaga: "I'm the next Iron Maiden"
Lady Gaga: "I'm the next Iron Maiden"
Lady Gaga was recently interviewed by CR Fashion Book magazine and talked about Iron Maiden, you can read some excerpts below. About Iron Maiden, Gaga said: "They're one of the greatest rock bands in history, in my opinion. Some people really don't know the importance of metal and the scope of it. Those guys were filling stadiums, and they still are. And it's because of the culture of the music, the poetry that's so powerful, that whenever the fans come together, they unite in the essence of what Iron Maiden is all about. I always used to say to people, when they would say, 'Oh, she's the next Madonna.' No, I'm the next Iron Maiden."